In 1841 a serf belonging to a Russian nobleman purchased his freedom and the freedom of his family for 3,500 roubles, being at the rate of 700 roubles a soul, with one daughter, Alexandra, thrown in for nothing. The grandson of this serf was Anton Chekhov... Chekhov's father, Pavel Yegorovitch, had a passion for music and singing; while he was still a serf boy he learned to read music at sight and to play the violin. A few years after his freedom had been purchased he settled at Taganrog, where he afterwards opened a "Colonial Stores." In 1854 he married Yevgenia Yakovlevna Morozova, the daughter of a cloth merchant of fairly good education who had settled down at Taganrog after a life spent in travelling about Russia in the course of his business. There were six children, five of whom were boys, Anton being the third son. Anton Pavlovich Chekhov, considered the father of the modern short story and of the modern play, was born in Taganrog on January 29, 1860 in a very small outbuilding on Politseiskaya Street, now Chekhov Street. The family was an ordinary patriarchal household of the kind common at that time. The father was severe, and in exceptional cases even went so far as to chastise his children, but they all lived on warm and affectionate terms. Everyone got up early, the boys went to the high school, and when they returned learned their lessons. All of them had their hobbies. The eldest, Alexander, would construct an electric battery, Nikolay used to draw, Ivan to bind books, while Anton was always writing stories. In the evening, when their father came home from the shop, there was choral singing or a duet. Pavel Yegorovitch trained his children into a regular choir, taught them to sing music at sight, and play on the violin, while at one time they had a music teacher for the piano too. There was also a French governess who came to teach the children languages. Every Saturday the whole family went to the evening service, and on their return sang hymns and burned incense. On Sunday morning they went to early mass, after which they all sang hymns in chorus at home. Anton had to learn the whole church service by heart and sing it over with his brothers. The chief characteristic distinguishing the Chekhov family from their neighbours was their habit of singing and having religious services at home. 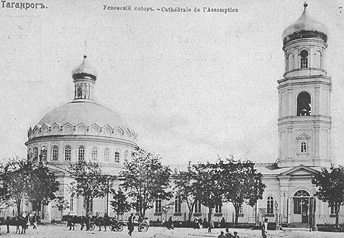 Assumption Cathedral in Taganrog (1818-1938), where Anton Chekhov was christened on February 10, 1860. Often the children would gather round their mother or their old nurse to hear stories. Chekhov's story "Happiness" was written under the influence of one of his nurse's tales, which were always of the mysterious, of the extraordinary, of the terrible, and poetical. Their mother, on the other hand, told the children stories of real life, describing how she had travelled all over Russia as a little girl, how the Allies had bombarded Taganrog during the Crimean War, and how hard life had been for the peasants in the days of serfdom. She instilled into her children a hatred of brutality and a feeling of regard for all who were in an inferior position, and for birds and animals. Chekhov in later years used to say: "Our talents we got from our father, but our soul from our mother." Anton attended a school for Greek boys in Taganrog (1866-68), and at the age of eight he was sent to the local grammar school (Gymnasium) where he proved an average pupil. Rather reserved and undemonstrative, he nevertheless gained a reputation for satirical comments, for pranks, and for making up humorous nicknames for his teachers. He enjoyed playing in amateur theatricals and often attended performances at the provincial theater. As an adolescent he tried his hand at writing short "anecdotes," amusing or funny stories, although he is also known to have written a serious long play at this time, "Fatherless," which he later destroyed. The first real crisis in Chekhov's life occurred in 1875, when his father's business failed. Threatened with imprisonment for debt, Pavel left to find work in Moscow, where his two eldest sons were attending the university. Yevgeniya, left behind with Anton and the younger children, soon lost her house to a local bureaucrat who had posed as a family friend. She and the children departed for Moscow in July, 1876, leaving Anton in Taganrog to care for himself and finish school. The episode provided him with a theme - the loss of a home to a conniving middle-class upstart - that was to appear later in the short story "Tsvety zapozdalyie" ("Late-blooming Flowers," 1882), and to mature in his last play, Vishnyovy Sad: Komediya v chetyryokh deystriyakh (The Cherry Orchard: A Comedy in Four Acts, 1904). The family struggled financially while Pavel looked for work, and Chekhov helped by selling off household goods and tutoring younger schoolboys in Taganrog. 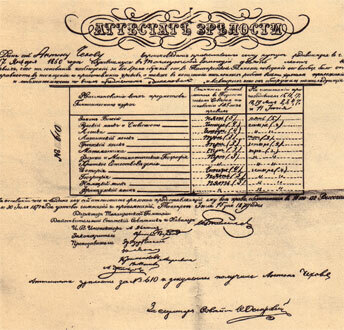 In 1877 Pavel found a position in a clothing warehouse, and in 1879 Chekhov passed his final exams and joined his family in Moscow, where he had obtained a scholarship to study medicine at Moscow University. The future world-famous playwright writer spent 19 years, nearly half of his life, in the home city where many streets and houses still look the way Chekhov saw them more than a century ago. Taganrog City has been protecting all memorial sites related to the years of Anton's childhood, adolescence and youth. First of all, this is the oldest (1809) Gymnasium in the South of Russia, where the Russian writer spent 11 school years and which is now a literature museum carrying his name. You can see Anton's desk and his classroom, the assembly hall and even the punishment cell, sometimes visited by the whiz kid. Another stop on your Chekhov tour might be the Merchant Moiseev's house, rented by the large family of Chekhovs, which is now opened to visitors as Chekhovs' Lavka (Colonial Stores). The Theater (1866) standing on the main street of Taganrog, Petrovskaya Street is the very theater Student Anton Chekhov frequented while studying Russian and World Drama. In 1879 Anton Chekhov left for Moscow to enter a medical university. Later, the Russian writer visited Taganrog many times with his last visit in 1902.
plaque in Old-Russian on the Chekhov House. Chekhov has done a lot for his home city. He did all he could to help Taganrog become a better and a more beautiful city. Taganrog turned for him into some kind of a duty, as the writer kept sending books from his personal library, many of which autographed by their authors, and buying dictionaries, encyclopedias, scientific literature according to a wish list that he had established. Thus an extensive and comprehensive library was created with foreign language literature and reference sections. In many respects thanks to Chekhov's efforts, the Cape of Taganrog is now crowned with a Peter I The Great statue, created by the famous sculptor Mark Antokolsky (1903). Anton Chekhov not only took part in engaging the first-class artist to create the monument, but also sent out fund-raising subscription lists. He was also giving new exhibits to the Art Gallery and left the City his personal library. Even when leaving for Badenweiler and knowing that this could have been his last trip, he gave orders concerning another books shipment to Taganrog. Chehov's life was filled with Taganrog. Life scenes, details and personages drawn from the home City of the artist can be recognized in his books. Two houses in Taganrog now carry memorial plates mentioning that Chekhov's literature characters had lived in them. Another memorial plaque - "Here lived Andrei Drossi, Anton Chekhov's schoolmate" - is on a house on Nikolaevskaya Street, now Frunze Street. This is where the first and the earliest Chekhov's plays were staged. When Anton Chekhov graduated from the Boys Gymnasium and was on his way to abandon the provincial city of Taganrog in favor of Moscow, no one could have known it was the greatest writer and genius that was leaving the city. But even after winning the whole world with his works, he still remained a Taganroger. 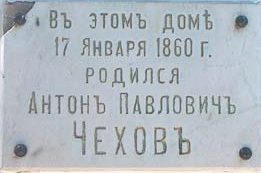 Chekhovs' Lavka "The Colonial Stores"
Memorial plate on the house of doctor Shedevi, image of "Ionych"